You can visit Ha Long Bay the whole year round. Though, from June to September, the temperature is usually highest in whole year and there are storms developing in the bay. October through November is the best time to enjoy safer weather conditions and cooler temperatures. March, April and May are also good time to travel to Halong Bay with blossoms and new greenery along the various cliffs. 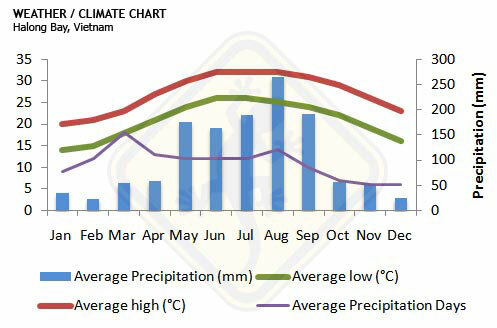 Halong Bay Weather is favorable for cruising year-round. In each time of the year, Halong Bay is beautiful in its own way! For more information on Halong Bay, please click here!